Step 1: take a look at the cart to see what the offerings are for the night. Step 2: go inside the Mexican bakery, step up to the register and place your order. Step 3: go back outside and hand your ticket to the guy operating the taco cart. Step 4: wait a minute or two, chat with the others while doing so. Step 5: eat Tijuana-style tacos in the parking lot, or go inside and sit at a table. It became my go-to place for cheap street tacos. Then the other week, I noticed that the cart was not there. I called the bakery and found out that the guy operating it was now making tacos in the back kitchen of the bakery. “They’re the same tacos,” a woman working that day told me in Spanish over the phone. 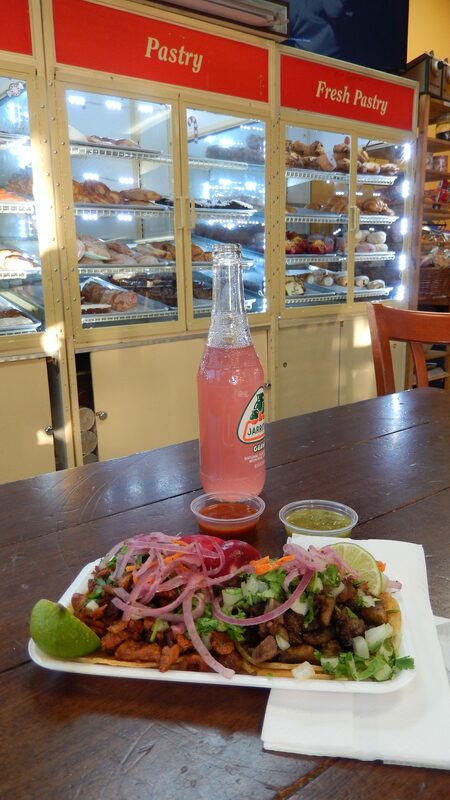 A week later, I entered the panadería and quickly placed my order: de lengua was taco number one. Number two was adobada because the de cabeza, another favorite of mine from the facial area of the steer, was not yet ready for serving. A handful of minutes later, I was handed a plate of food not unlike what you would find south of here on the streets of Tijuana. I told him so last time I ate at the cart, to which he smiled and said that he serves the same thing as people there do. I concurred. The tacos piled high with delicious meat called for something to drink. I surveyed the cooler, but then asked if they had any jugos naturales. Orange juice was the only option, so I went back to the cooler and grabbed a guava soda, flipped off the cap with the bottle opener tied to the cooler with a string, and went back to the table. “How are your tacos?” It was the man who made tacos at the cart. I did not ask any questions, only adding compliments about his food and that I was happy knowing that I could still get tacos close to my house that are as good as on the other side of the wall. Tongue on fire from the salsa, I washed the remainder of the tacos down with the sweet fizz of pink fruity soda. Looking at the baked goods, I saw apple fritters. I bought one, thinking of breakfast in the morning.